Home Blogging tips Enable Allowed Sites in Google AdSense? Enable Allowed Sites in Google AdSense? I set my own domains on Allowed Sites in Google AdSense last 2 months. Somebody was trying to sabotage me by clicking lot of the ads. I had no choice and enable own domains to be counted in Google AdSense only. However, I discovered that it was not a perfect move. Yes, it does stop the sabotage act but it also reduces my Google AdSense earning. Why? Okay, not every visitor will come to your website directly. For example, a visitor translated your website using Google Translate. Google AdSense does not detect your website address but Google Translate address. Therefore, the earning is not counted there. 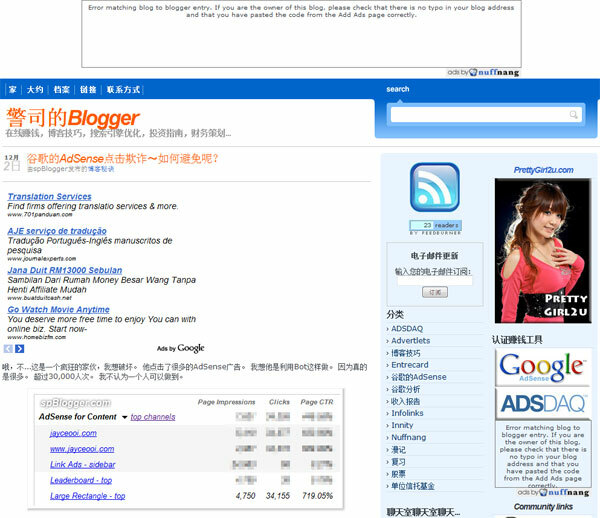 Besides Google AdSense, Nuffnang also use that method to display its ads. But we can’t do anything here. Next articleStock market is going up or down?